West Texas Intermediate was down 0.6% to $US67.34 per barrel at 3:15 p.m. ET. 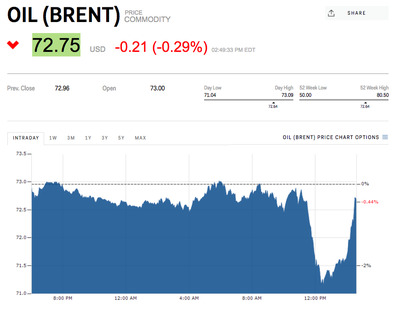 Brent, the international benchmark, shed 0.3% to $US72.74 a barrel. Both had fallen more than 2% in midday trading. Jameel Ahmad, global head of currency strategy and market research at FXTM, said there is a “risk off sentiment across global markets” amid a currency crisis in Turkey.